It is that bewitching time just before dawn when the sky begins to tint. The major star Sirius still burns strongly just above the changing horizon. The sliver of the moon hangs tenuously above it. A vague pink glow gives way to wild red that spills across the sky. Remember the phrase: Red in the morning? The romantic cliche has always viewed dawn as a time of promise. A new day comes bringing endless possibility. Yet if the colors of the morning sky glow deep red and even purple in monstrous thunderheads, that which has been sleeping comes awake to again stalk the land. For those storm clouds herald the reawakening of the Sunshine Patriot. This creature can deceive as the dawn deceives, cloaking itself in the optimism and possibilities of past dawns, especially those dawns of long ago that we but vaguely remember and because we only vaguely remember them, they have become myths. It’s all there in The Hymn: its evocation of “the twilight’s last gleaming,” “the dawn’s early light” and the still-standing, bullet-shredded flag. The Sunshine Patriot feeds on this like Dracula on blood, stalking victims with pleas of loyalty. People will offer their very necks to him and when they do they will never feel the bite but instead a rush as if they had been injected with a powerful drug. Then they become recruits in an army that if the dawn is bloody enough can grow quickly into powerful, unthinking battalions not merely willing but clamoring to donate more of their own blood and thereby sacrifice their freedom. It happened like that on 9/11. What follows is the details of the consequences of that day of the Sunshine Patriot. 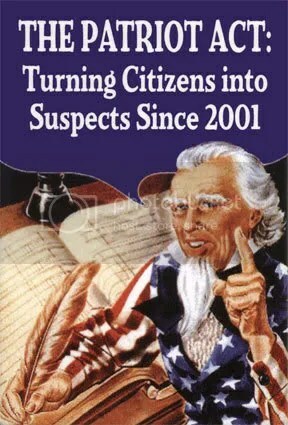 It tells the story the only way it can be told–in the words of that which Sunshine Patriots gave birth to–the ironically-named Patriot Act. As one of the few Americans who read the original act cover to cover, my intent is to call up some of its choice phrases so that all of us can truly know what the Sunshine Patriot took from us that September. In the background is the chorus, like in a Greek tragedy, adding its own voice. In that chorus the Sunshine Patriot becomes a Makeshift Patriot. The lyrics come from rapper Sage Francis’ “Makeshift Patriot,” which may be the best 9/11 song ever recorded. And it’s time to show this world how big our edifice is! The term “domestic terrorism” means activities that– (A) involve acts dangerous to human life that are a violation of the criminal laws of the United States or of any State; (B) appear to be intended– (i) to intimidate or coerce a civilian population; (ii) to influence the policy of a government by intimidation or coercion; or (iii) to affect the conduct of a government by mass destruction, assassination, or kidnapping; and C) occur primarily within the territorial jurisdiction of the United States. Wondering how after it settles we’ll find who provided power to radical rebels. It is the sense of Congress that officers and employees of the intelligence community of the Federal Government, acting within the course of their official duties, should be encouraged, and should make every effort, to establish and maintain intelligence relationships with any person, entity, or group for the purpose of engaging in lawful intelligence activities, including the acquisition of information on the identity, location, finances, affiliations, capabilities, plans, or intentions of a terrorist or terrorist organization, or information on any other person, entity, or group (including a foreign government) engaged in harboring, comforting. financing, aiding, or assisting a terrorist or terrorist organization. And waits for the suit and tie to come home. Establish requirements and priorities for foreign intelligence information to be collected under the Foreign Intelligence Surveillance Act of 1978 (50 U.S.C. 1801 et seq. ), and provide assistance to the Attorney General to ensure that information derived from electronic surveillance or physical searches under that Act is disseminated so it may be used efficiently and effectively for foreign intelligence purposes, except that the Director shall have no authority to direct, manage, or undertake electronic surveillance or physical search operations pursuant to that Act unless otherwise authorized by statute or executive order. The fall out goes far beyond the toxic cloud where people look like debris. The Director of the United States Secret Service shall take appropriate actions to develop a national network of electronic crime task forces, based on the New York Electronic Crimes Task Force model, throughout the United States, for the purpose of preventing, detecting, and investigating various forms of electronic crimes, including potential terrorist attacks against critical infrastructure and financial payment systems. Any financial institution that makes a voluntary disclosure of any possible violation of law or regulation to a government agency or makes a disclosure pursuant to this subsection or any other authority, and any director, officer, employee, or agent of such institution who makes, or requires another to make any such disclosure, shall not be liable to any person under any law or regulation of the United States, any constitution, law, or regulation of any State or political subdivision of any State, or under any contract or other legally enforceable agreement (including any arbitration agreement), for such disclosure or for any failure to provide notice of such disclosure to the person who is the subject of such disclosure or any other person identified in the disclosure. With a 10 second clip put on constant loop to provoke US angst. A provider of electronic communication service or remote computing service shall disclose a record or other information pertaining to a subscriber to or customer of such service. “We taught that dog to squat. Any person–(1) who is engaged in a trade or business; and (2) who, in the course of such trade or business, receives more than $10,000 in coins or currency in 1 transaction (or 2 or more related transactions), shall file a report described in subsection (b) with respect to such transaction (or related transactions) with the Financial Crimes Enforcement Network at such time and in such manner as the Secretary may, by regulation, prescribe. I took a break from editing this post, stopping at a gas station to fill my tank (with $2.89 a gallon gas, courtesy of our leader who once was in the oil business), when I chanced to hear a conversation between two Russian immigrants, one of them the clerk at the check out counter. The clerk was saying how he wished the Communists were back in power because the governments since had all been nothing more than a legalized mafia. His friend was nodding in agreement. Then when they realized I had walked in, the conversation took a very strange turn. All of a sudden the clerk began talking about how much he loved the United States of America. After I paid my bill and was walking out the door he said to me with almost an apologetic tone, “Interesting conversation, no?” I said yes it had been an interesting conversation. Only after walking to my car did I realize what had happened (maybe because the experience was so disconcerting): this Russian immigrant who had been longing for the return of the Communists was scared as heck what this unknown American might do with his words. That an immigrant from our former Cold War adversary was worried that an American who happened to hear a political conversation might turn him in was the cruelest of ironies. Would he put out a flag in the dawn’s early light on the Fourth of July, I wondered? This entry was posted on Saturday, October 6th, 2007 at 9:18 pm and is filed under Uncategorized. You can follow any responses to this entry through the RSS 2.0 feed. Responses are currently closed, but you can trackback from your own site. download identity 2003 Great text. I like your web design also. continue your good work. Great text. I like your web design also. continue your good work.